Ener Hax is the writer at iliveisl.com. iliveisl is short for I Live in Science Land. Supposedly the site is a partner site for an upcoming educational book that will use a 3d world for the interactive component. Ener Hax earns my Opensim Community Member of Distinction. Heres why...Ener Hax's writing has made iliveisl.com one of the most informative user perspective sites about opensim in existence. Of course, the core developers and other contributors to the Opensimulater project are most significant, but without user uptake, nothing is of real value. 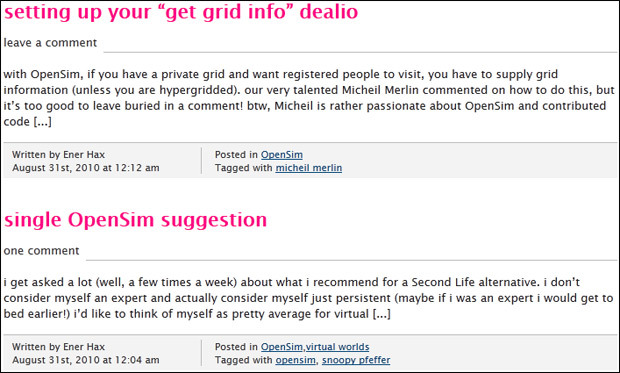 As a nod to the sites importance, some significant names in the Opensim community have replied to iliveisl blog posts. Perhaps inadvertently, the prolific nature of the posts, are one users account of a fall of the heyday of Second life to the adoption of Opensimulator for the iliveisl project. 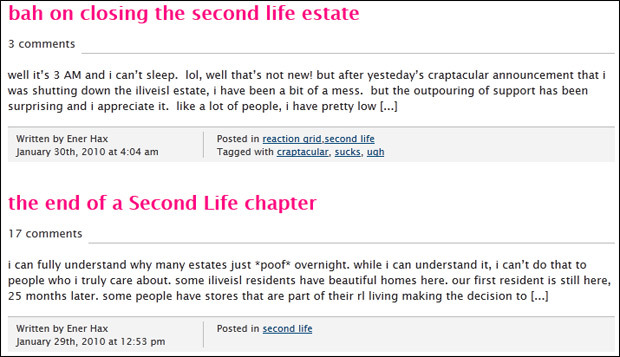 A chronology of iliveisl - AKA a resident migrating from Second Life to Opensim. 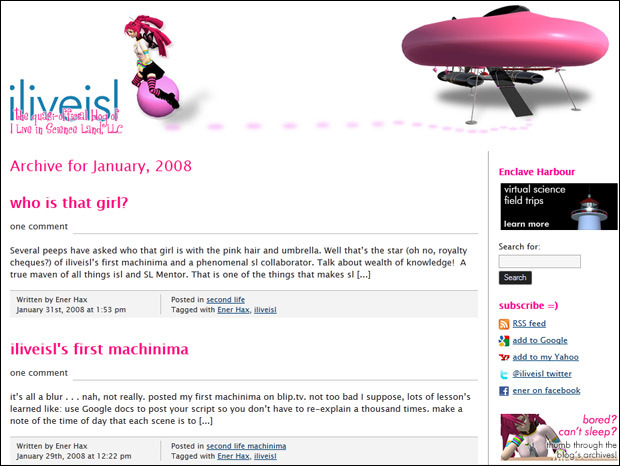 Jan 2008 - Ener Hax's first post. Hax was very active is SL. Early posts show this. April 2008 - Ener Hax calls for Estate Agents for the iliveisl regions in Second Life. This would have been about the time the Second Life Openspace regions were a viable option. In September 2009 there were fifty posts in one month. January 2010 - It is decided to wind down the iliveisl Estates in Second Life. January 2010 - by now iliveisl and Ener Hax have progressed to the Opensim based Reaction Grid. Later Ener would move from Reaction Grid to other hosts as she finds her feet. Opensim hosting options are one of the biggest challenges an ex SL resident faces when uptaking Opensim. August 2010 - There were 62 posts in August 2010. The posts are starting to highlight two types of posts: tutorial/walk through based on getting things going in Opensim, and secondly, political commentaries around Opensim and Second Life. August 2011 - A hiccup. A successful, active blog, where respondents are significant people such as Justin Clarke-Casey. This can attract... weirdos. The "Euro" stage was one in which a person posted irreverent tripe. Ener Hax's attitude was that all opinions are valid. Opensim Zealot's attitude was that this was destroying the Opensim community. Fortunately, Eurominuteman/James O'Reilly has gone on to harass the MineCraft community. January 2012 - What iliveisl is all about - learning in a 3d environment. In this case, sewerage processing. The green pipe is a standard color. Green carries sewerage, blue carries clean water. In this picture, a turbine, driven by sewerage flow, powers a generator. Enclave Harbour - "Virtual guided field trips"
I never really understood Euro anyway and didn't often reply to him but now I have seen this I guess it puts a spotlight on his antics. BTW, this blog is great and Ener deserves the special distinction! @Gaga Thanks for your reply. Your Metaverse Traveller blog is pragmatic and of great quality. On your blog re prediction for example "My 2nd prediction fell way short of my wishful thoughts but the latest release of Hypergrid...": this is tricky isn't it, and as you say, Avination not getting HG implemented is a shame. Hopefully for 2012. HG will morph into the 3D web. My wish is Ener's HG icon(the little person in a circle) sits in taskbars and blog icons. @Ener "i actively banned Euro"
I am glad to hear you actively banned Euro. It takes commitment and is indeed a last resort. - He has 35 blogs. - I know of one educator that took a few days off for stress due to Euro hammering his blog. While I am all for leveraging search and social networks as a strategy, damaging others is poor form and not acceptable. @Ener "the blog shows what one person went through as a form of encouragement." Indeed it does. I know others will have done similar things, but the documentation of your progression stands as the only(that I know of) historys of Opensim as a real world tool.